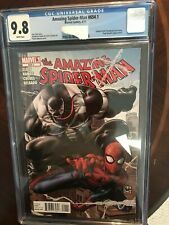 Amazing Spider-Man #654.1 (Apr 2011, Marvel) 1st Agent Venom Solo Story! The Amazing Spider-Man #654.1 (Apr. 2011, Marvel) NM (9.4) Thompson as Venom !!! Amazing Spider-Man 654 & 654.1 NM+ Marvel 1st Flash Thompson as Agent Venom HTF!